Have you ever been through a season in life that totally rocked your faith? A time where everything seemed to be going wrong and nothing made sense? A time when your hopes were dashed—and then dashed again? A time when you wondered if God heard your relentless prayers, or maybe wondered if He even cared? 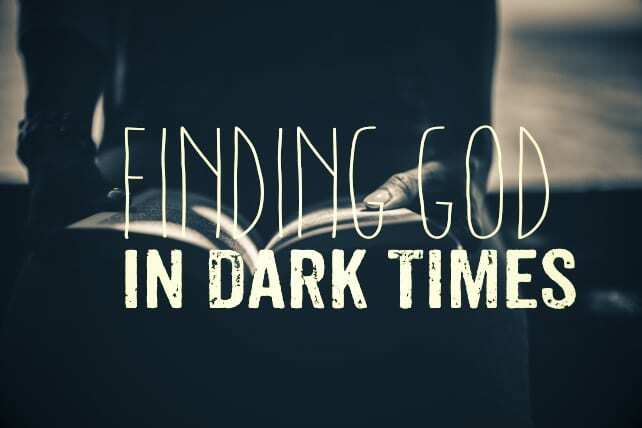 My family and I have been walking through one of these dark seasons lately. And the truth is, from the many emails and messages I get weekly, I know for certain that many of you are walking through a similar time in life. We look around and either we ourselves or someone we know is facing something really hard. It seems as though injustice, evil and pain are right around every single corner. The perfect life we had imagined took a wrong turn, and we find ourselves feeling helpless, hopeless and maybe even feeling alone…stuck at a seemingly dead end, a place we never imagined we’d be. Suffering comes in so many different shapes and forms, and even though I don’t know what it is you are dealing with, I do know one thing: It’s left you broken. So what do you do when life doesn’t turn out as you planned? What do you do when you’re facing hard times and wondering how you’re going to get through? What do you do when the darkness seems so thick that it’s hard to remember the light? Friend, I don’t know about you, but I know that this year, I’ve asked those same exact questions. I’ve wrestled with God, cried out to him and wondered what on earth He is doing. Boy is it easy to forget this when you’re walking through a hard time. Honestly, sometimes in the middle of all the stress and suffering it feels as though God is against me. But in order to survive, I have to see past how I feel and cling to the deep love of Christ. I have to remember that He is FOR me, not against me. I have to remember that His heart breaks for me even more than my heart feels broken. I have to remember that every single tear, and every single prayer, is caught, is heard and is cherished by Him. I have to remember that He loves me so deeply, that He allowed Himself to go through the GREATEST suffering this earth has to offer, allowing His Son to endure a brutal, unjust and humiliating death so that I could have the hope for something greater than this life. No matter what I’m going through, and wherever life takes me, I can be sure that His love is certain, His love is sure and His love will carry me. Next articleHow Can Teens Use Social Media to Share the Gospel? Debra Fileta is a Professional Counselor, speaker, and author of True Love Dates: Your Indispensable Guide to Finding the Love of Your Life, where she writes candidly about love, dating, and relationships. She’s also the creator of this True Love Dates Blog! Connect with her on Facebook or Twitter!